Er dere klare for å gjenta fjorårets suksess med stand up komedie! Hold av fredag 15.Mars for da kommer Halvor Johansson, Dex Carrington og Maria Stavang (Piateed) til U.-KA festivalen i Ålesund! Kjent fra MTV-serien Dexpedition. Den engelsk-talende komikeren Dex er ikke bare en favoritt blant det unge publikummet, men med sine betraktninger treffer han høyt og lavt. Maria Stavang er allerede blitt et internett-fenomen under domenet Piateed, hvor hun har over 100.000 følgere. Nå har hun entret hovedscenen på Latter til stor jubel fra publikum, og vi kan ingenting annet enn å glede oss til å se denne kommende humorstjerna utvikle seg. Halvor Johansson er relativt ny innenfor standupsjangeren, men har allerede gjort stor suksess på scener rundt om i landet, og det på rekordtid. 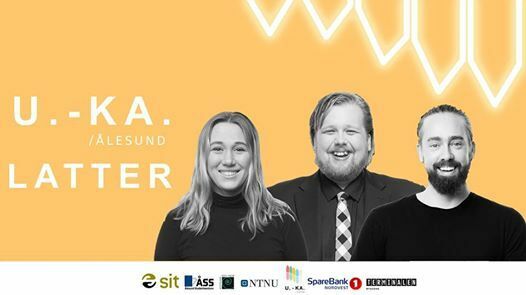 Han er en av de yngste som blir brukt som konferansier på de største scenene i landet, som Latter og Stand up Bergen. Are you ready to repeat last year's success with stand up comedy! 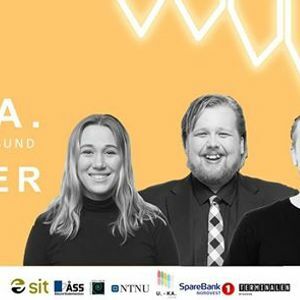 Save the date, Friday 15.Mars because comedian Halvor Johansson, Dex Carrington and Maria Stavang (Piateed) are coming to the U.-KA festival in Ålesund! Known from the MTV series Dexpedition. The English-speaking comedian Dex is not only a favorite among the young audience, but with his considerations he hits high and low. Maria Stavang has already become an internet phenomenon under the domain Piateed, where she has over 100,000 followers. Now she has entered the main stage of Latter to great rejoicing from the audience, and we can do nothing but look forward to seeing this upcoming humor star evolve. Halvor Johansson is relatively new to the stand-up genre, but has already made great success on scenes around the country and in record time. He is one of the youngest to be used as conference host on the largest scenes in the country, such as Latter and Stand up Bergen. The doors open at. 7:00 p.m.
PS: The show will be in norwegian, with the exception of Dex Carrington, who will do his stand up in English.